As a freelancer, you know that keeping track of your projects, clients, and invoicing is critical to being successful. Unlike working for a company, you probably don’t have a project manager an regular meetings to help you keep on track, or a complicated and expensive ticketing system to keep every little task organized and prioritized. You may also have to track the different people at every one of your clients’ companies from whom you need to get assets, approvals, or payments. You are your own personal assistant, so how do you do it, while having time to do the work itself? I have been freelancing for six years, and it has taken me some time to establish a system that saves me time and really gets the job done. I use four different applications to achieve this, which may seem like a lot, but not really if you think about all of the things that you use on a daily basis when you work anyway, like your email, web hosting, Google Analytics, Google search console, etc. Trello is a project-management web application that is made by the same people that make the ticketing system Jira, Atlassian. Jira is designed for large organizations to keep track of tickets, while Trello is a little more casual and user-friendly. I have a Trello board for each of my clients, and then columns in each client’s board for To Do’s, projects I’m currently Working On, On Hold items, and projects that are Completed. 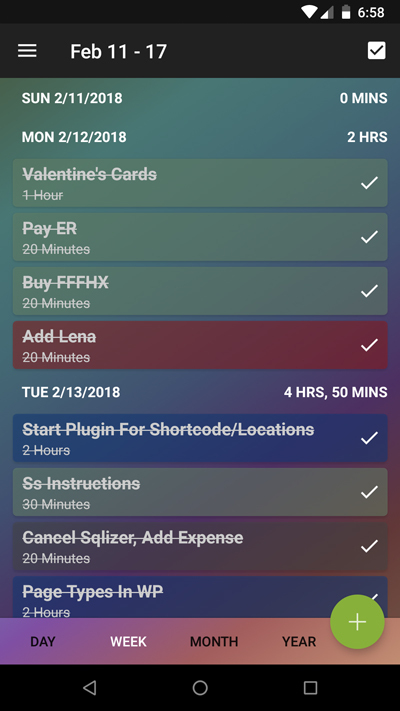 Within columns are Cards, and in each Card, I can add different pieces of data, like checklists, descriptions, comments, and even color-coded labels like Bug, or Urgent. 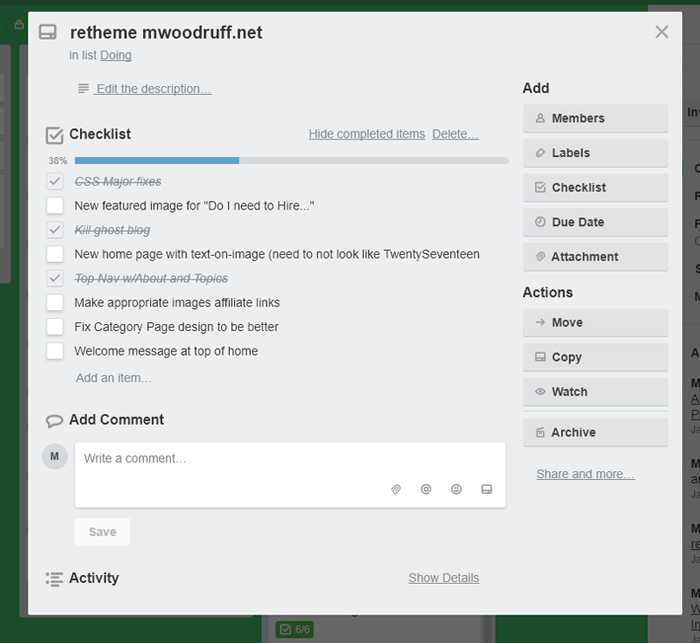 What I have trouble with in Trello is that I cannot see all of my work across multiple clients in one place. If I had active projects for 5 clients, and I go to my Trello dashboard, I can only see the top of every single column for each client. I can’t see just active projects all together. To solve this issue, I keep a separate to-do list for my clients in another app called Simply Goals & Tasks. This deceptively simple Android app has been a lifesaver. I use it to schedule my days, both for my work as a freelancer, and in my life as a mother and volunteer. 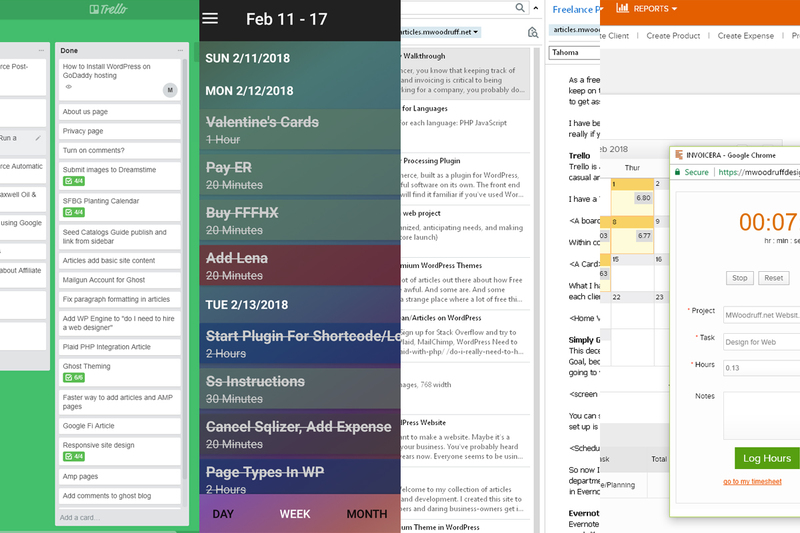 As in Trello, I assign each client their own color (called a Goal, because you can track time spent on tasks for every Goal) and then, when I’m planning my work day, I go to Trello to find the active projects that I need to work on, and then, in SG&T, assign the amount of time I’m going to work on them next day. Of course, it doesn’t necessarily mean I will only work for 2 hours on a particular project, but it keeps it on my radar, so that I don’t forget anything that needs to get done the next day. 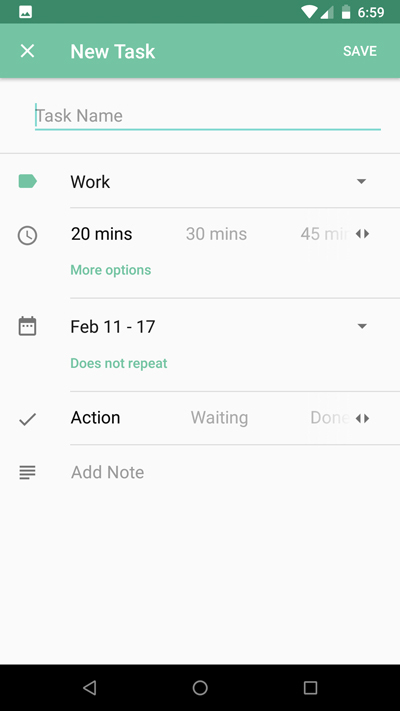 You can schedule tasks for specific times, specific days, just inside the week, or even longer out. I use this app for all kinds of things I used to use Google Calendar for, like reminders. The color coding with categories that I set up is more intuitive to me then having to assign random colors in Google, and remember which one I last gave so-and-so client last time. 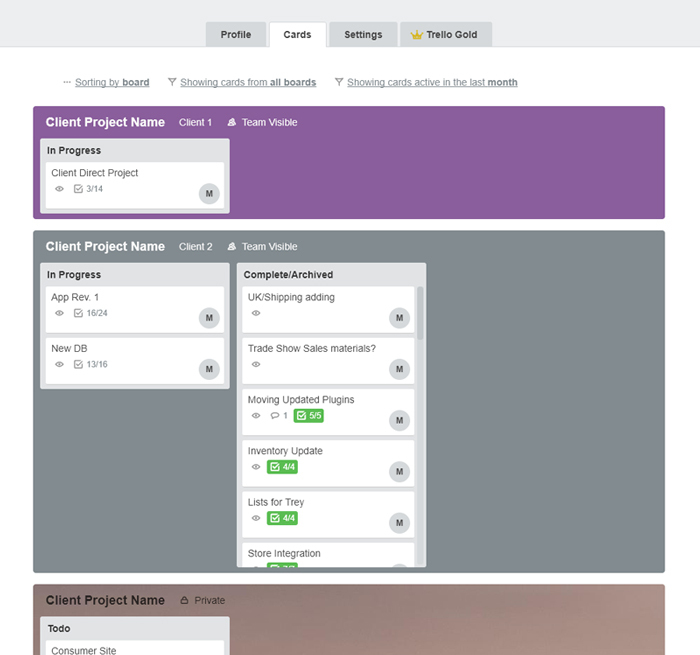 So now I know what projects to work on and in Trello I can get a little bit more detail on each, but what about all that other information I may need to complete a task or project? I need to get copy from a client’s Marketing department, but who was the copywriter again? What were the test server credentials for that API I need to integrate? Instead of searching my email every time I work on this project, I keep track of that kind of information in Evernote. 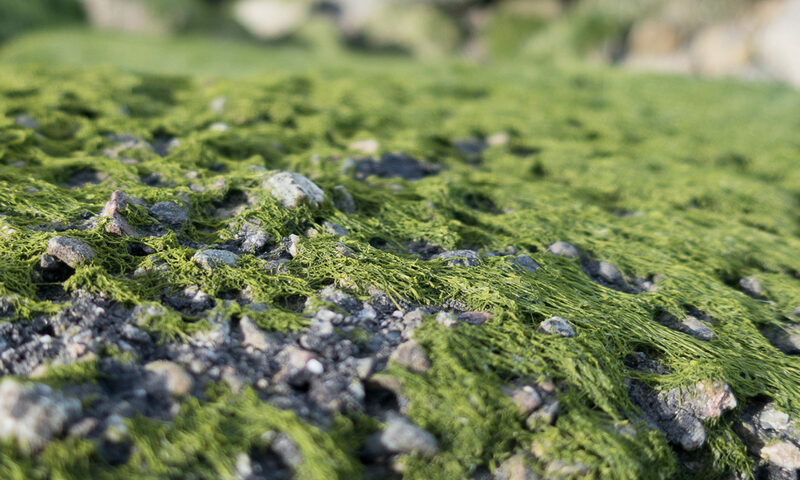 Evernote is another one of those deceptively simple but perfect apps: you’re surprised that it exists at all and then that you ever lived without it. 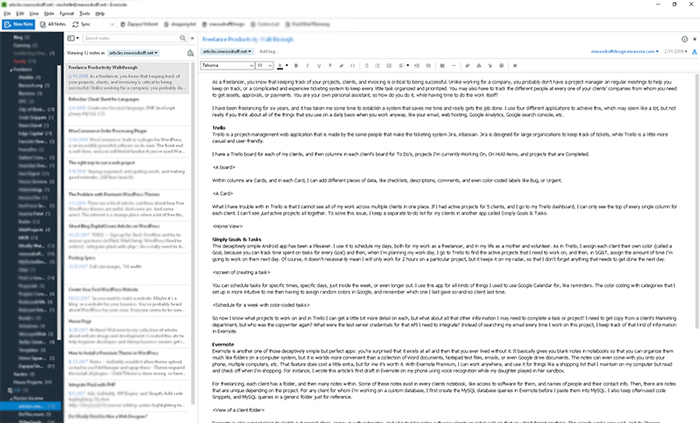 It basically gives you blank notes in notebooks so that you can organize them much like folders on a computer system, but it is worlds more convenient than a collection of Word documents, Notepad text files, emails, or even Google drive documents. The notes can even come with you onto your phone, multiple computers, etc. That feature does cost a little extra, but for me it’s worth it. With Evernote Premium, I can work anywhere, and use it for things like a shopping list that I maintain on my computer but read and check off when I’m shopping. For instance, I wrote this article’s first draft in Evernote on my phone using voice recognition while my daughter played in her sandbox. For freelancing, each client has a folder, and then many notes within. Some of these notes exist in every clients notebook, like access to software for them, and names of people and their contact info. Then, there are notes that are unique depending on the project. For any client for whom I’m working on a custom database, I first create the MySQL database queries in Evernote before I paste them into MySQL. I also keep often-used code Snippets, and MySQL queries in a generic folder just for reference. Evernote is also a great place to sketch out project ideas, come up with estimates, and also to take notes with new clients on initial calls so that you don’t forget anything. The search works very well, and its Chrome extension to save website snippets can be very useful for reference. If you’d like to receive an invite to Evernote that will also get you a free month of Evernote Premium, contact me. I will not use your email address for anything else, I promise! The first three applications help my freelance business run, but the one that helps me get paid in the end is Invoicera. I used to track my time manually in Evernote for each client, then I would painstakingly add those numbers up and divide by 60 minutes to get hours, then create invoices by hand. It would take me at least an hour every two weeks. Invoicera costs $20 a month (once you go beyond three clients). 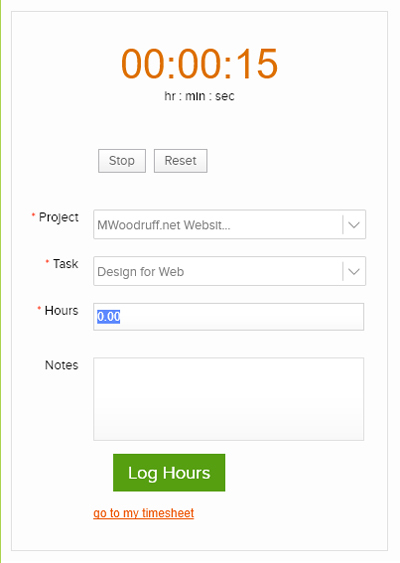 It provides time tracking with a timer that you can turn on and off and assign to clients and projects, and invoicing, so I can create my invoices every two weeks in about 10 minutes flat from my recorded time clock entries. There are also graphs of my outstanding and paid invoices, I can easily see who has paid me and who is not, and I can turn on automatic reminders to make sure my clients know that they have yet to pay me. These are all things I would rather not spend my time on, so I find it well worth it to have the software do it for me. The application also tracks my expenses for each client and adds them to my invoices automatically. And, at the end of the year, when I need to see how much money I’ve made, I can get that report and take it to my accountant, because not all of my clients send me a 1099 form. Being a freelancer has become easier and easier every year, especially since I’ve finally adapted these four applications into my freelancing workflow that keep me organized and make the business side of freelancing that much easier.